1. When you log in to Laghaim Client, choose the server you want to play (your character will appear in the chosen server) and input your ID Password for connect to the server. Option This menu is use for change screen solution (640 x 480, 800 x 600, and 1024 x 768), option 3D and volume level edit. The recommended Solution is 640 x 480 dpi. ID Creation: You can register to receive ID on the website or www.laghaim.in.th only. 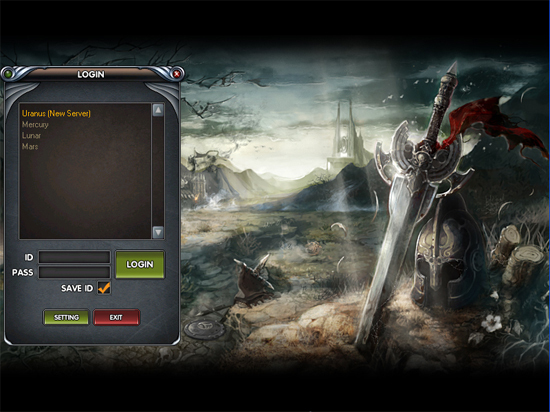 - After you log in, you will enter to character select screen. If you still not have the character, click “Create” button for create new character. 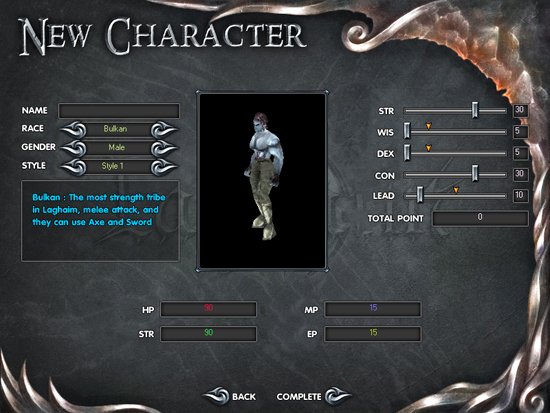 - From this screen, you will find that you can create most 5 characters. So if you want to input ID again, click “Back” button. And if you want to delete your character, click “Delete” button and there is the window appears for input your password to confirm delete character. - When you finished create the character, your character will appear in the blank. You can choose the character by click on character. Name : Input your name that you want and it must follow the specification in ID register page. Hair Style : There are five types of hairstyle and two colors. Race : There are five tribes in Laghaim and they are not having the similar. Bulkan The most strength tribe in Laghaim, melee attack, and they can use axe and sword to kill monsters. They are suitable for stand in the front line in the war. 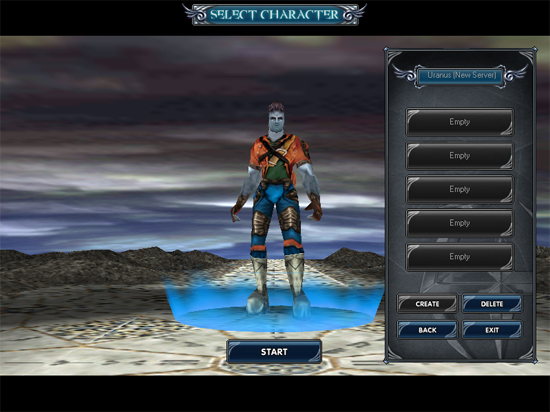 Kailipton Spell user who use power of elements to defeat monsters in Laghaim. Although they have spell and curse abilities that have powerful, but their body are so weak. Human Man is come from the far away earth. They can use high technology weapon clearly. But they cannot use sword and spells. Their weapon is all type of gun and they can cut gems and assemble any the equipment. Aidia They can use natural and creature power. Their movement is flying. Although Aidia has the weakest body but they can summon the creature to help them fight the monster. Strength This status point is necessary for using axes and swords (for Bulkan) and it affect to health point but less than vitality. Intelligence This status point is necessary for using spells such as Kailipton staff, and Aidia ring. Moreover, it affect to the mana point too. Dexterity This status point is necessary for using guns (Human) and it affect to Human energy point. Constitution This status point affect to health point directly. And it increase health point more than Strength. Charisma This status point affect to party system. In each 5 points, you can increase member in party 1 more. The most is 7 members. Vitality This is the health point or called “blood”. Mana This is magic point or Mana for Kailipton, Aidia, and Hybrider hammer class. Stamina This is tiredness point or Stamina. When you run or attack monsters until its 0, your movement will change to walk instead. Bulkan and Hybrider use this point to use skills. Electric Power This is electric point and necessary for Human to use guns and skills.